(Alternet) In 1614, when the telescope was new technology, a young man in Germany published a book filled with illustrations of the exciting new things being discovered telescopically: moons circling Jupiter, moon-like phases of Venus, spots on the Sun, the rough and cratered lunar surface. The young man was Johann Georg Locher, and his book was Mathematical Disquisitions Concerning Astronomical Controversies and Novelties. And while Locher heaped praise upon Galileo, he challenged ideas that Galileo championed – on scientific grounds. You see, Locher was an anti-Copernican, a fan of the ancient astronomer Ptolemy, and a student within the Establishment (his mentor was Christoph Scheiner, a prominent Jesuit astronomer). Locher argued that Copernicus was wrong about Earth circling the Sun, and that Earth was fixed in place, at the centre of the Universe, like Ptolemy said. But Locher was making no religious argument. Yes, he said, a moving Earth messes with certain Biblical passages, like Joshua telling the Sun to stand still. But it also messes with certain astronomical terms, such as sunrise and sunset. Copernicans had work-arounds for all that, Locher said, even though they might be convoluted. What Copernicans could not work around, though, were the scientific arguments against their theory. Indeed, Locher even proposed a mechanism to explain how Earth could orbit the Sun (a sort of perpetual falling – this decades before Isaac Newton would explain orbits by means of perpetual falling), but he said it would not help the Copernicans, on account of the other problems with their theory. …Those who insist that the Apollo missions were faked, that vaccines are harmful, or even that the world is flat – whose voices are now loud enough for the ‘War on Science’ to be a National Geographic cover story and for the astrophysicist Neil deGrasse Tyson to address even their most bizarre claims – do not reject the scientific process per se. Rather, they wrap themselves in the mantle of Galileo, standing (supposedly) against a (supposedly) corrupted science produced by the ‘Scientific Establishment’. Thus Locher matters. Science’s history matters. Anti-Copernicans such as Locher and Brahe show that science has always functioned as a contest of ideas, and that science was present in both sides of the vigorous debate over Earth’s motion. It's funny that what easily made sense to them (those who followed the Ptolemaic model) makes absolutely no sense to us today. It's very telling how the power of knowledge affects the way we habitually think in certain ways. Pretty sure there are truths we hold dear today will be basically rubbish to those who have greater knowledge in the future. 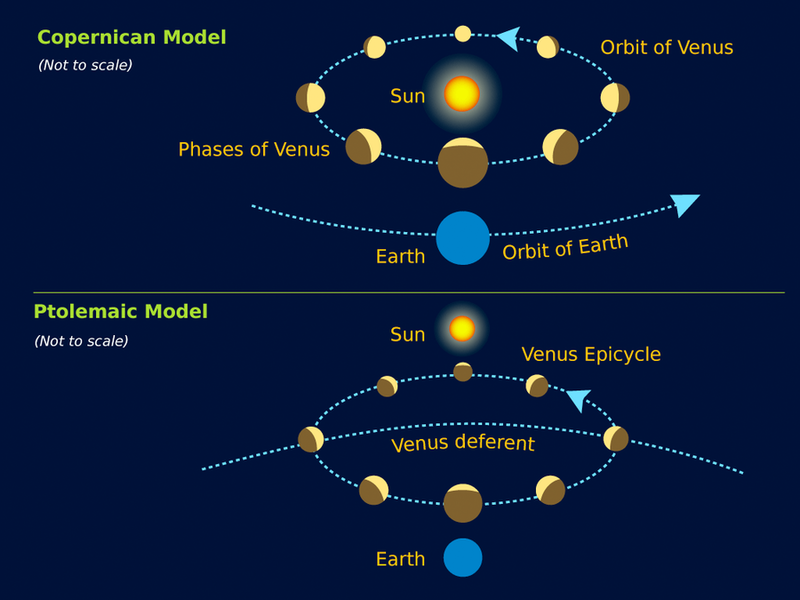 I've heard that those against heliocentrism said that the other planets could orbit the sun, which would explain Venus' phases. Yes, there was the "compromise" system of Tycho Brahe: inner planets (Mercury and Venus) revolve around Sun, and outer planets (Mars, Jupiter, Saturn) still revolve around Earth. This was too artificially and ugly, even for his era.